Having read Maura’s guide to eDating the Old School Way (reviewed here), I was interested in learning more about the stories behind the author. 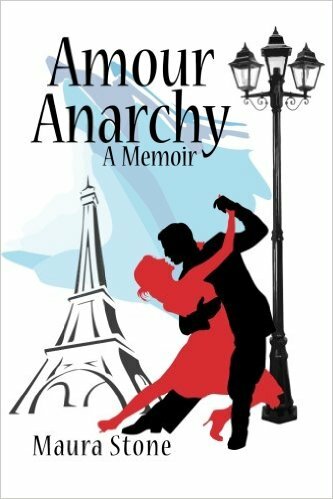 I also wanted to get a sense of what Paris and Europe were like in the ‘70’s. While I’m not much for traveling abroad, Paris has always been on my bucket list. And while I’m sure there’s a vast difference between the City of Lights back then versus now, it’s always fun to live vicariously through someone else’s adventures. Maura discovers so much more than culture shock when she’s on her own. This truly is a coming-of-age tell-all. I appreciate how honest and open she is about her personal experiences, particularly where her relationships are concerned. While so many of us often lock up the memories of our wild teenage years and hastily throw away the key, Maura shares her stories with wild abandon, immediately endearing you to the girl she was and to the woman she’s become. Nothing is taboo. Her perspective from back in the day showcases the immature maturity Maura had while traveling abroad. I know that sounds a little strange, but I could sense the girl behind the stories, melding with the maturity she’s gained from her experiences. Growing up among plenty of situations that many of us would handle awkwardly and with kid gloves, all while away from her parents. I think that takes real guts. Maura has that in spades. While I found myself annoyed with her main love interest at times, due to his personality, I do realize just how influential he must have been on her life. That’s even more in focus as the story progresses, blending beautifully with the ending. While many of us may never have Paris, we’ll certainly have those interesting childhood relationships that often shape who we later become in life, and they are often the ones we learn the most from. Thanks to Maura Stone for the book in exchange for an honest review. She has one copy to give to a lucky reader! Giveaway ends January 8th at midnight EST. I don't get to travel, but there are a lot of places I would love to see. I have a FB friend who lives in Wales and after seeing her pictures and looking at the calendar she sent to me for Christmas, I would love to go there one day. My husband and I have planned a trip with our son to Mexico over march break. I can't wait! My sister and I are planning a trip this Fall to Canada and Upper New York and Niagara Falls. I haven't been to Niagara Falls and I'm looking forward to seeing them again. I would love to travel to Italy and England. I would love to see Sweden, including Norway. It's going to take a little time, but I am currently saving for and planning a surprise trip to Ireland for my husband & myself for our 25th wedding anniversary. All of Great Britain beckons.